I remember seeing Rudy Guiliani, New York City’s iconic ex-mayor, speak at a conference a few years ago. He was sharing his views on leadership. At one point he was telling a story where the leader was talking to his team about all the things he worried about. “I worry about the competition.” “I worry about the quality of our products.” “I worry about our position in the marketplace.” “I worry about how our customers percieve us.” I don’t know about you but too much talk of “what worries” is demotivating. Mr Guiliani wondered why anyone would ever follow this kind of leader. I believe that leaders who use this tactic believe they are doing the right thing. Worry about negative outcomes motivates action to resolve those worries. While I think this is somewhat true I believe that a more uplifting approach can be learned. Worry is a pretty active approach because the requested action is often to assemble a team and build a strategy to resolve the worry. If the opposite approach is to use statements that involve a more hopeful tone it would sound something like this. “I hope that our competition see us as daunting.” “I hope that the quality of our products improve.” “I hope that we can find the right competitive position in the marketplace.” “I hope that customers percieve us in a positive light.” The challenge with hope is that all too often it stops there. Intelligent optimism starts with hope and then adds the necessary action. For example, “I hope that the quality of our products improve. In fact, I believe that we can improve product quality by 20% over the next year. It is important to put our best people on a team to dream up the best ways to make this happen!” Wow! What started off as a possible paralyzer (the worry) now has become a possibility! Who wouldn’t want to participate in making that possibility a reality? Intelligent optimism is very active. It is based on surrounding people with the possibility of achieving something that might be hard but it causes us all to dig deep to bring our best stuff to the task. Think about it. Worry causes worry. I start to worry about me. Worry about product quality easily and quickly becomes a worry about the future of the company. Worry about the future of the company easily moves to worry for my job. Worry for my job jumps to worry for my ability to pay for my mortgage. Oh, my goodness everyone run for the doors! This spiral is a tough one to control. But intelligent optimism is contagious in the opposite direction. If we improve product quality by 20% I will be proud to have been a part of that team. If product quality increases the company will grow. If the company grows there will be more opportunity for all of us. Let’s get started!! When leaders recognize the feeling of worry it is important to see it for what it is. It is an impetus for action. But not by expressing the exact worry. If I am concerned about product quality what is that based on? Is it a valid concern or blown out of proportion? If it seems like a valid concern then the way to turn this around is to express it with active hope. As leaders we have to bring possibility to this and bring it into a positive light. Leaders have to be aware of how their words and approaches affect and impact their people. We need to lift people up and show them the way. Intelligent Optimism beats Worry every time. 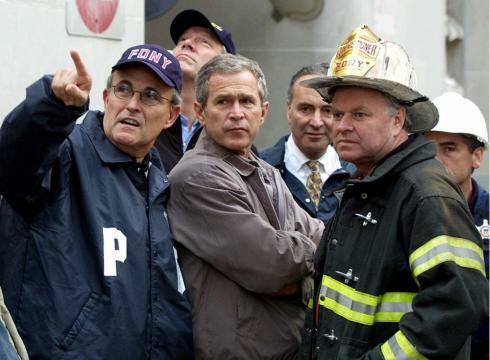 Rudy Guliani had to lead the City of New York and the nation through an incredibly tough and devastating time. While he wouldn’t label it this way it is obvious to me that he was optimistic, intelligently so, and very active in leading people through hope. Thanks for sharing your thoughts and insight into what leadership is really all about.